So yeah, it was thanksgiving. A nice, long, 4 day weekend. Didn't do much else but work though: family is far away, friends were busy with their own plans and all. But I managed to catch up on the comic work, and that is extremely good! One page to go, only one page to go. And I also crammed in a whole lot of Water Tribe. That's my Thanksgiving gift from me to you all, who've stayed and read so far. As if Zhao, who kept losing against Aang AND Zuko could possibly beat Azula. Sorry old man. But I'm not done with him yet, ha ha! How much is Azula correct? How much is it her mind playing tricks? That's the only image that kept jumping in my mind. Airship sound effect stolen from Miyazaki's Nausicaa (english translated manga). It's too good a sound, and I couldn't think of a better one. Going to get some rest now. And a good thought for my dad, who's getting a heart "défibrillateur" (whatever it's called in english) installed on Tuesday. Hang in there dad, it's supposed to be common, easy surgery *crosses fingers anyway*. You will have to use your powers of imaginations to animate it I'm afraid (cheaper to make too!). The moment there's surgery being done, heck even going into a hospital, I keep fingers crossed. Thank you! Someone forgot to tell him about the lightning. Oops. Though he was sort of told this type of bending existed (a small comment, heard in the fire nation, thought he didn't need to remember), he'd never seen it. Absolutely and totally fantastic (she says, reading this nervously at work and hoping nobody sees her screen because she has to know what happens next). Zhao fairy shouldn't be put next to anything that can burn. If your Christmas tree is made of concrete, maybe. Gah! Intense much? You're one of those artists whos work is just so amazing that you just forgot you're reading--it's just unfolding magically or something (eh, sorry, no coffee, no coherent mind-workings). But that last image makes the post. Heh. Trying not to crack up in the middle of a crowded bar/cafe right now... "You are Speeecial!" Thank you for your kind words (not so incoherent despite lack of caffeine). Okay, honestly? Epic as any battle in the show. E P I C.
Azula looks so intense... in every friggin' panel @_@ She's crazy, I love it. Unrelated: good luck to your dad! Have to admit to have had a ton of fun drawing crazy Azula throughout. She IS FUN! Drawing one Crazula a day keeps the gloom away. The operation is standard in the States here. I've have a friend's father go through the procedure. Other than the recovery time he had to go through, he is still quite healthy. So I would not worry too much and besides he has family, like you, so that should make it easier. ROFLMAO! 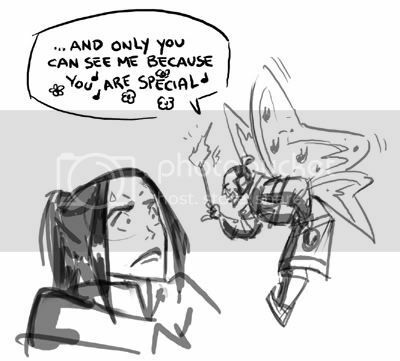 A Zhao fairy hallucination?! A fairy of what I wonder; one of stubbornness/grumpiness maybe? I'm kinda far away to help him recover. I will see him soon though. Less than a month. There should be a sign beside the spirit pool about not bathing. Weird stuff happens. Azula doesn't need anymore weird stuff happening. She's trying to keep those bits of sanity together. ZhaoFairy would just burn stuff up, even if you wish it or not. Good luck to your father. At leas implanting a defibrillator is so streamlined now, his prognosis with one may actually be a good one. >a href="http://i184.photobucket.com/albums/x15/rufftoon/zhaofairie.jpg">LOL!</a> All Zhao needs now is a wand and a tutu, a la, Tinkerbell (except Tink's was more like leaf frond, at least visually, in the Disney thingamabob). Yeah, it's pretty much the same in English, too.. Good luck! My first thought was "JACKPOT! 16 luscious pages of Water Tribe!" My second thought was "Did poor Johane get *any* rest?" But I can relate to the need to do creative work even (especially?) if it's not what I should be doing. The airship sound "DN DN" would be like a boat's bell "ding ding"? I can't remember what the airships sounded like in Miyazaki's movie. I'm sending happy thoughts and good wishes to you and your dad (and your mom). I did get rest. I would nap when my body wanted to crash, and there's only one evening that I went to bed past 11pm. I don't know if Zhao is so much sinking as swimming. Gonna have to wait and see. Aw. Well, I was rootin' for yah, Zhao! If he's getting one installed it's probably a pacemaker... A defibrillator's more of the '"Clear!" *kajunk*' thingy you see in hospital shows. I was rootin' for him too but...it's friggin Azula!! My dad kept saying defibrillator instead of pacemaker. I guess he'll know tonight when they prep him up. Won't promise to do other long ones like that before the end. We'll see. Beautiful, graceful, fight sequence and I am shivered when Azula looked into the oasis and Zhao's body wasn't there. Zhao is the eternal optimist when it comes to winning a fight. He thinks he can beat everyone. Except Iroh. He sees Iroh, he turns heels and flees! Good old Zhao has adapted with his time in the Water Tribe- too bad his fighting still isn't top notch. If he'd had a bit more time to practice.